Picture of Minkyu Kim by courtesy of Ota Mrákota/Relmost . Minkyu Kim is in pole position to become the youngest winner in European Tour and the European Challenge Tour history as he takes a two-shot lead into the final round of the D+D REAL Czech Challenge. The 17 year old, who began the day one stroke off the pace, carded a double-bogey six on his opening hole after being handed a two-shot penalty for mistakenly repairing a pitch mark that was off the putting surface. The South Korean immediately responded, however, by birdieing the second and then adding three gains in a row on the sixth, seventh and eighth holes before taking sole possession of the lead with a late eagle at the par five 16th. 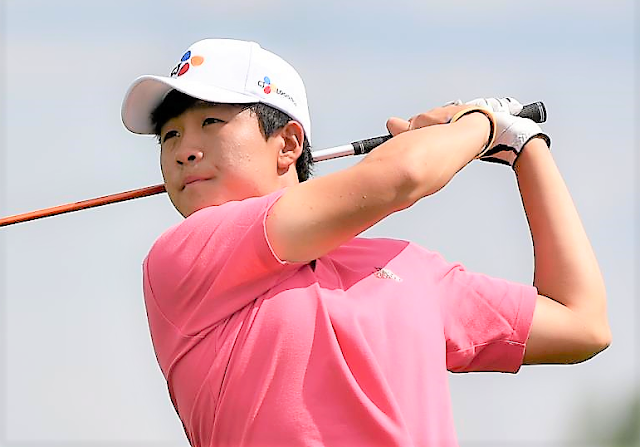 Having already triumphed twice as a professional on the satellite EuroPro Tour, the young South Korean admits he has seen big improvements this week and believes he has a good chance of adding to his trophy cabinet tomorrow. “I have to say I’m very pleased with my game,” he said. “Before the tournament my game wasn’t looking so good, but my drives and iron shots have improved as soon as the competition started. “It was quite a tough start for me today, but my putts started to go in from about half way through and I think things started to go much better from then on. “The course here is very pretty first, and I was a little worried at the beginning of the week as it’s not exactly a short course. But the greens are very nice, and the overall conditions have been very good. “I’m sure I will be nervous tomorrow but I’ll try to stay confident and do my best to get a good result. Should the teenager triumph tomorrow, he would become the youngest winner in Challenge Tour history and surpass Italy’s Matteo Manassero as the youngest champion on any of the European Tour-operated circuits. The pathway to the record books will be a difficult one to navigate for Kim, who has to thwart off a host of experienced players. Two shots back is Challenge Tour winner Sebastian Soderberg, while 2018 Turkish Airlines Challenge champion Joachim B. Hansen and 32 year old South African Anthony Michael, are both three behind on 11 under par. It was another positive day for golf in the Czech Republic as crowd favourite Filip Mruzek continued to climb up the leaderboard with his second consecutive sub-70 round, a three under par 69 that thrust him into a share of tenth place. The biggest movers on day three were 2016 D+D REAL Czech Challenge winner Damien Perrier and Spaniard Mario Galiano Aguilar who both carded six under par rounds of 66 to jump 38 spots on the leaderboard. Scot Grant Forrest is T7 on 207, only five shots off the pace. He would have been even closer but for a double bogey 6 at the 18th hole in his third-round 71.